Hi there Leo Listeners. 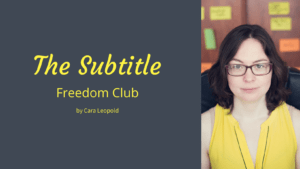 It’s Cara here from Leo Listening, where I help advanced English learners fall back in love with their favourite films and series by teaching them how to break free from the subtitles. So I’m talking a lot about basic listening skills – issues that you need to understand anything really. Not just films or TV series, but native speakers, conference calls, or whatever it is that interests you. The core of the issue is that listening is quite a poorly taught skill. In the past, I didn’t teach listening. I tested it. I got my students to do multiple choice quizzes. Listening to something in a class and then doing a quiz is not developing your listening skills. It’s simply a test of where those skills are at now. It’s not teaching you anything. 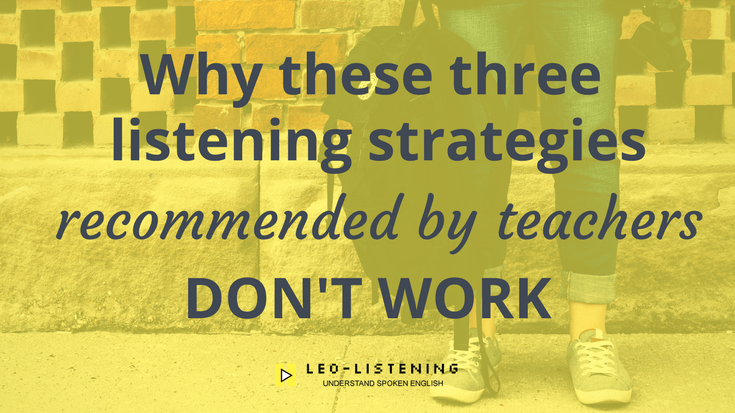 Because most teachers don’t teach listening and they don’t get you to actually improve those skills, what they do instead is teach compensatory strategies. 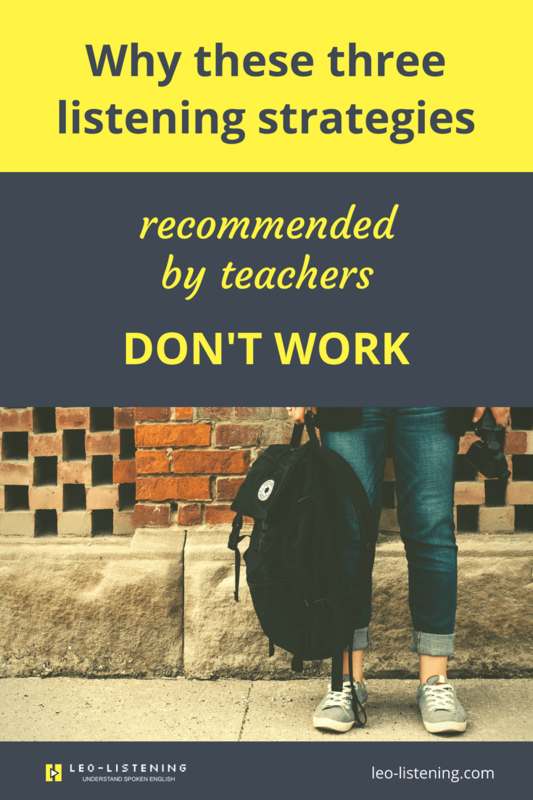 These are strategies designed to make up for the fact that you can’t understand something. These are all things that we do in our native language. It’s true. The thing is though, if you rely only on these types of strategies, and you never take the time to learn how words really sound when we say them fast, and how connected speech affects how words sound, you’ll never improve. The first of these strategies that we hear a lot about is if you can’t understand, use the context to guess. I understand that. Guessing can help, but don’t rely on it, ok? I’m going to show you some practical things that you can do to go beyond guessing. 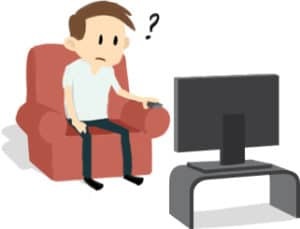 Guessing from context could be things like using images – if it’s a film or series, you obviously have a lot of visual clues. It could be the general context. You know that you’re listening to a conversation, so that gives you certain clues. Or, it’s a weather report, so that gives you certain clues. Another way is to use your real world knowledge or background knowledge of the situation. Fair enough. The problem with all these scenarios is, what happens if you guess wrong? If you guess wrong and you can’t use enough of the actual audio to reinterpret your guess, you might misunderstand everything. So rather than only relying or over relying on guessing, you’re going to have to listen to real native speech and come to terms with the fact that you’ll need to train your ears to catch many of the most common words. You’re going to have to do things like dictations, shadow reading, repeating out loud what you hear, and using ear training websites. Sorry! Another compensatory strategy that we hear a lot about is just focus on the stressed words. Obviously, when English is your native language, it’s easy for you to say. And yes, native speakers don’t attend carefully to every single word. But the reason that we don’t need to do that is because we can decode everything automatically and that’s the same for you in your native language too. You don’t pay attention to everything because your brain automatically decodes it all without any effort. So if English isn’t your native language and you’ve been just listening and using this “focus on the key words” or “focus on the stressed words” strategy, you’re not learning how to decode speech. By that I mean you don’t know how to decode all the unstressed words. These are all the little grammatical words in English that can be very difficult to catch such as auxiliary verbs, conjunctions and articles. These words are important to the meaning. It’s not only stressed words that carry a lot of the message. A negative auxiliary can change everything in a sentence. Can’t rather than can. Don’t rather than do. It makes a big difference. When I hear people learning English say “I only caught 50%”, it’s because you don’t know how to catch all these unstressed grammatical words. At the same time, you also don’t know how words sound when they join together, when they blend together, when sounds disappear. That’s the idea of connected speech and it’s one of the keys to understanding all the details you’re missing and I’ll come on to it again in a second. Another thing that you hear that’s an example of compensatory strategies is to focus on the meaning, not the detail. This is connected to the previous point. If all you do is focus on stressed words and guess from context, yes, you’ll probably get the overall meaning. But the thing is, you’ll never understand the details of the message. You’re always going to feel a bit left out in the cold. Like somebody isn’t telling you something. Like you’re missing something. Because all the little words can make a big difference. Here’s an example with the negative auxiliaries. When we make a sentence negative in English, we add a negative form, but it can be hard to catch. It can change sentences completely. If somebody says to you “Oh you should come. You should come to the party”. That’s positive. But if someone says “you shouldn’t come”, and that negative auxiliary is hard to catch because I don’t pronounce the T sound at the end, that changes everything entirely. They’re telling you not to come! But you might not be able to catch the difference. Many common expressions that you already know get modified in fast speech. A really good example is questions. So really quite different to what you might expect. The good thing is once you know how all these little details, the auxiliary verbs, the prepositions, the articles are pronounced, you can start adding that type of pronunciation to your English to sound more natural. You can start using more contractions, more linking, and blending the sounds in the way that native speakers do. Some more examples are sentences like We’ve done it”. So “we have” becomes “we’ve” and then “done” and “it” join together – “dunnit”. Another one is “d’ya wanna?” So the question “do you want to” goes through a lot of changes. We’ve got a blend at the beginning and the “do you” becomes “d’ya”. We also lose the vowel of “do”. “Want to” becomes “wanna”, which is a really classic example of connected speech. So a much better use of your time than just relying on all the compensatory strategies that you hear, that make you feel good, is to actually spend some time getting in to how English really sounds. Even if it’s hard. Even if it’s scary. 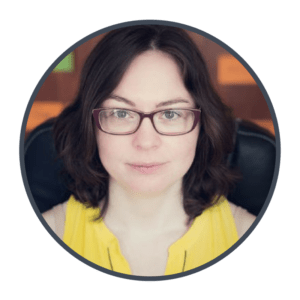 I’m going to add some links to resources that will enable you to train your ears, practice this further, learn more, and start to move away from only relying on things like context or guessing, and actually relying on your ears. Because you can rely on them. If you have any questions about this or any comments, please don’t hesitate to leave them. I’ll be with you again very soon. Hopefully I’ll hear from you.